Discussion in 'Other Builds' started by 90beater, Mar 20, 2019. 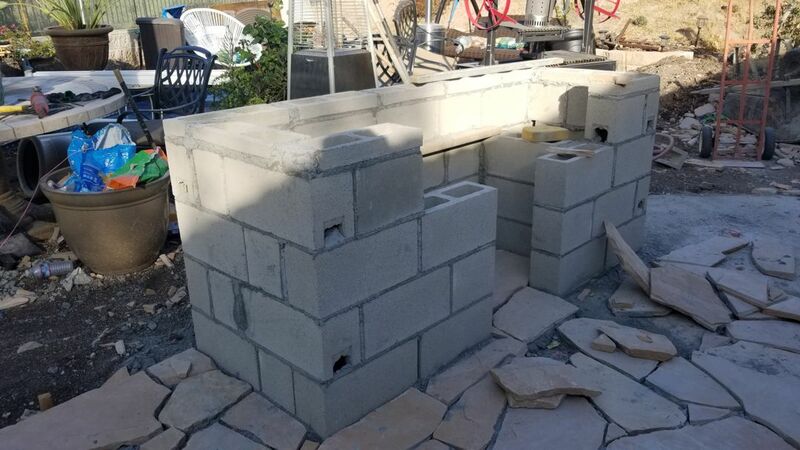 We had our back yard renovated and I had to get in something I always wanted. A Santa Maria grill. I didn't have time to build one so I found the best one I could buy. It's from Sunterra International. I love cooking on this thing. 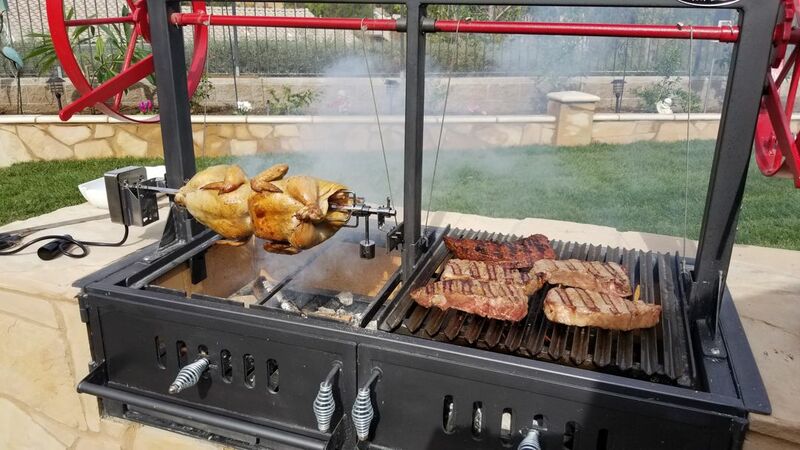 I can remove the grill and add a rotisserie to one side if needed. I did build a pair of aluminum covers to keep the rain and critters out. Luckily I do travel up to Santa Maria once a month or so and can buy the actual Coastal Red Oak and seasonings they use. A few things I have cooked on it. finished off ribs after the smoker. civilsmoker, weedeater, SmokinAl and 5 others like this. Wow! Great setup you got there! Thanks for sharing! 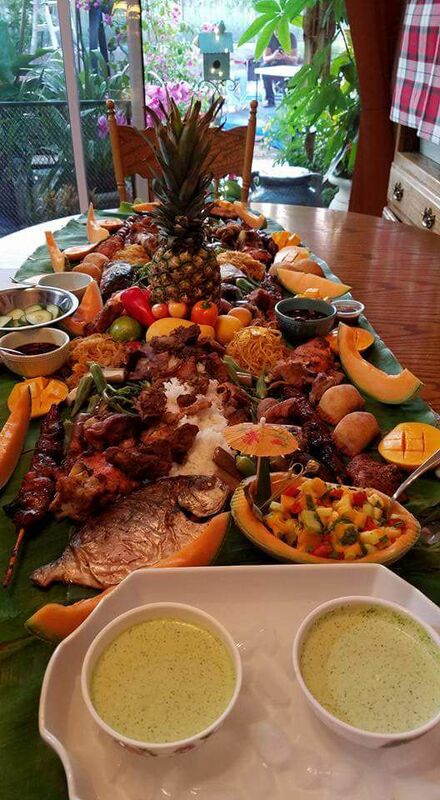 Man is that a purty looking grill and plate of chow. Beautiful grill Beater. Real pleasant spot you have there. 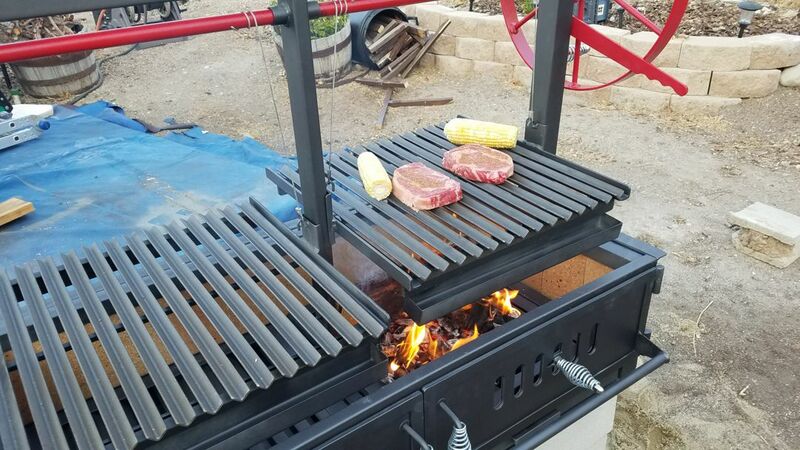 That is one great looking grill! Wow! 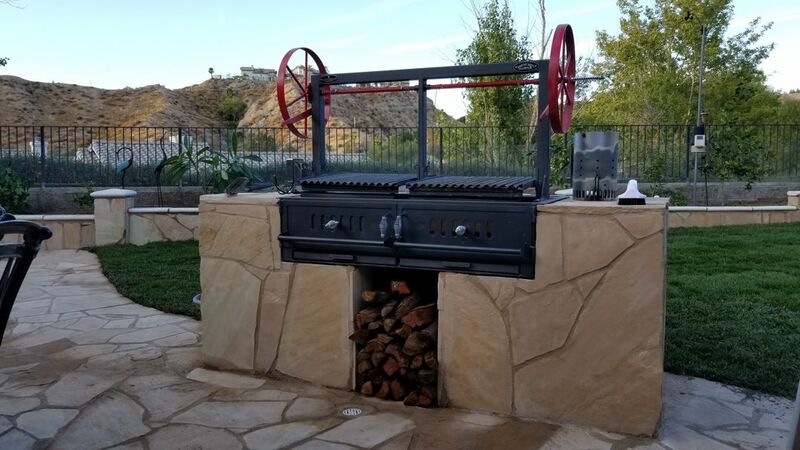 What a grill and a beautiful back yard. Man that is a nice looking rig you got there. I’m jealous! Food all looks great too! Like! Enjoy , that's a great space you have there . Awesome!! I would never leave the yard haha! Very Nice! Sunterra International makes a nice grill. I have studied every pic on their web page looking for ideas and such! I really like the two zone cooking! I have been asked a few questions so I thought I would post a few pictures of the stand being built. It came fully assembled in a crate. 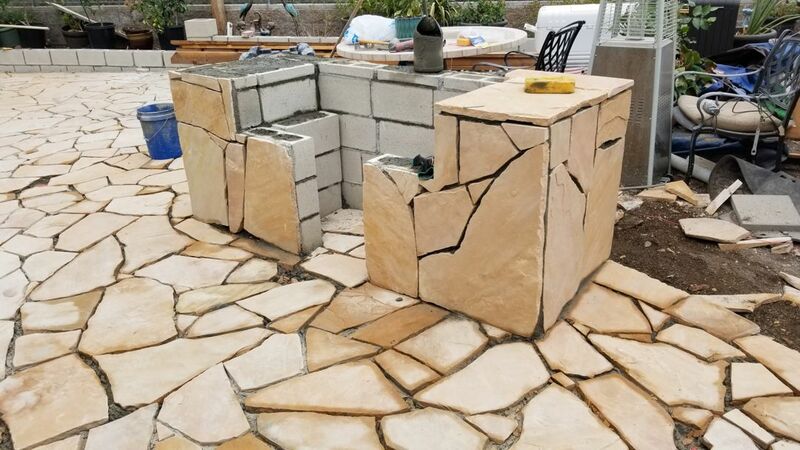 The base was made of cinder blocks. All the crevices were filled with cement. Then it was wrapped in flagstone. 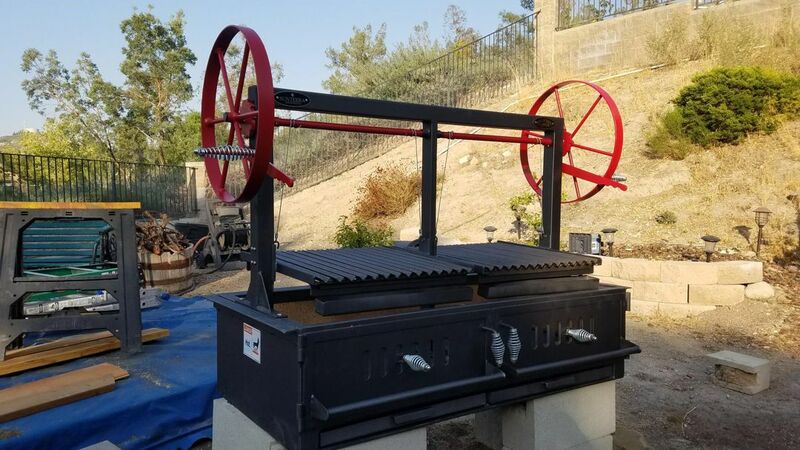 How much does the grill, itself, weigh? Was it hoisted onto the finished base by man power or equipment? I spy the charcoal chimney on the grill. Did you break her in before the base was finished? Haha yeah! I rolled to into the back yard and used a car jack to get it on cinder blocks and had to test it out. It weighs right around 460Lbs. It took four guys including me to use an engine hoist to get it into place. I placed a couple sheets of 3/4" plywood down to roll it around. The guys did a great job and it fit perfectly into place. That is where my great wife and her friends come into the picture. There is always a feast and everyone leaves with a full belly and some food to take home. Just a couple of pics. I did 8 rib eyes tonight and didn't get out my camera. As for the comments on our yard thanks for noticing. 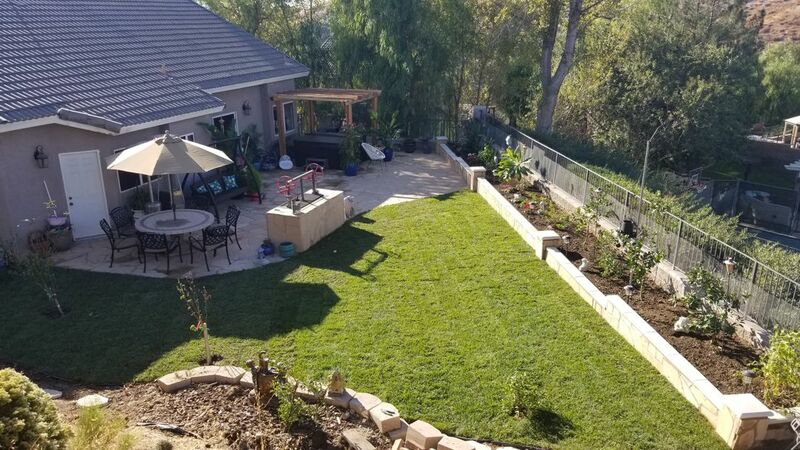 I bought the house in 2001 and last year we decided to renovate the back yard. I said to my wife if we are going to do it we will do it right. I usually like to build things myself like the redwood pergola over the spa and the matching trellis for the grape vines to grow on. But for this large job we had it done. 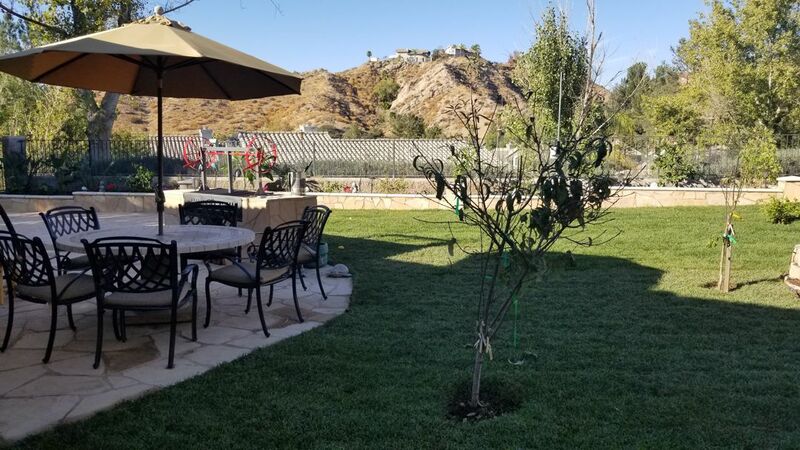 We have been so happy with it that a couple of months ago I convinced Rema that we should have the front yard done to match the back. She was hesitant to spend that much at first but now that it is done we are both loving it. We had the same contractor that used the same materials. The driveway was slightly widened, with a new wall on each end. The old sidewalk was removed to the front door and replaced with a large front patio including new steps and light pillars. I hope that's not too off topic. I just wanted to share what we have done. Beautiful shots of your laden table 90. Your guests have to feel special, I know I would. If my home looked like your's, front to back, I wouldn't want to leave to go anywhere else. how do you like the V style grates? I've been contemplating something similar, but for some reason am thinking I would prefer a more traditional grate. seems they block a lot of the heat since they are so wide.